Acknowledging the importance of an active faith life of prayer and reflection, students participate in the spiritual life of the school through daily morning prayer, monthly prayer services, all school and class Masses throughout the liturgical/school year. School wide Masses: Celebrated monthly on holy days of obligation, Catholic Feast Days, along with special themes important to the school community (Respect Life, Cristo Rey Day, Thanksgiving, Farewell). All are invited. Class Masses – All Theology classes attend Mass once each semester in the school chapel. 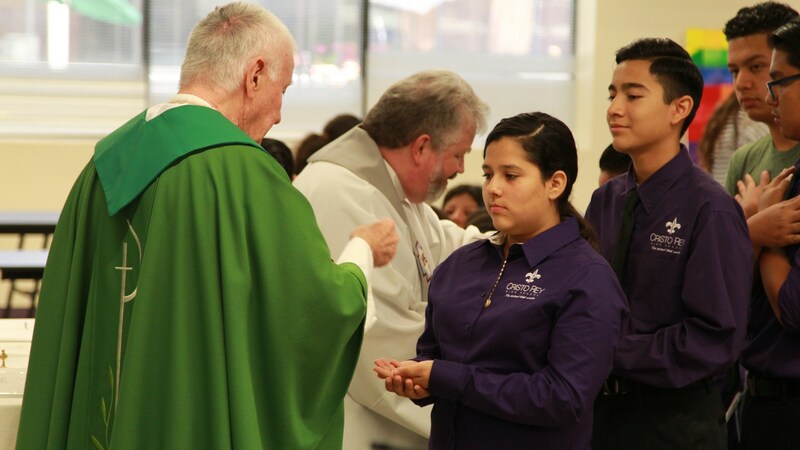 Each class prepares for liturgy and serves as lectors, musicians, and Eucharistic ministers. Morning Chapel Masses: Celebrated on Wednesdays at 7:30am. All students, staff and parents are welcome to attend. Reconciliation Services: All students, through their Theology classes are offered an opportunity to celebrate the Sacrament of Reconciliation during Advent and Lent. The school chaplain is assisted by visiting priests. Individual confessions are available by appointment with the Chaplain. Prayer: There are a number of opportunities at Cristo Rey for prayer and reflection. The school day begins with school wide morning prayer at 8am; all theology classes begin with student lead prayer; the afternoon begins with the school wide Examen. In addition, the Chapel (with the Blessed Sacrament) is open to all students throughout the day.